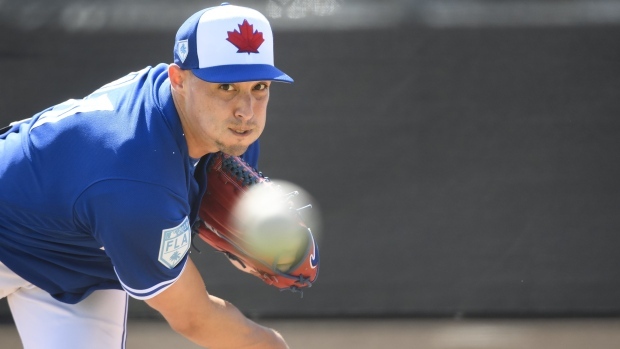 DUNEDIN, Fla. — Aaron Sanchez pitched two no-hit innings as a Toronto Blue Jays split squad battled to a 1-1 tie with a Pittsburgh Pirates split squad in pre-season baseball action Friday. Sanchez had one strikeout and one walk over his two innings of work. While a small sample size, Sanchez's outing is reason for optimism following two injury-plagued seasons. He has also struggled with blisters and nail-related issues on his throwing hand for the last couple seasons. Sanchez had a breakout season in 2016, when he played in the all-star game and had an American-League best 3.00 ERA and 161 strikeouts over 192 innings. Toronto's Logan Warmoth tied the game against Pittsburgh with a solo home run in the bottom of the eighth. The Pirates had taken the lead in the top of the sixth when Patrick Kivlehan scored on a throwing error. Meanwhile, in Kissimmee, Fla., another Jays split squad fell 4-3 to Atlanta when Sean Kazmar scored on a Hector Perez wild pitch in the bottom of the ninth. Jonathan Davis and Lourdes Gurriel Jr., hit solo home runs in the top of the first to put the Jays up 2-0. A Kendrys Morales RBI single put Toronto up 3-2 in the top of the fifth, but Ryan LaMarre scored on Andres Blanco's ground out into a double play in the bottom of the inning to tie the game. Perez took the loss for Toronto, while Wes Parsons picked up the win.